West Honiara opened the game with much promise and looked exciting with how they opened up the pitch when they had the ball and closed down their opponents into narrow attack which they could easily manage. This worked well enough for them in the opening stages of the game but Koloale’s hard work was repaid when Paul Wale pushed through a pass that Paulona Wale turned into the back of net while attempting to clear and the ‘men in green’ were in front. Another defensive error soon after cost West Honiara dearly when Atana Fa’arodo Jnr. won the ball from George Ladoga before he turned to the left and fired past Polycarp Bonave for Koloale’s second goal. Further efforts from Koloale in the second half did not have the luck of their first half goals. Fa’arodo came close again with his trademark quick draw and lightning strike but his effort came off the bar. 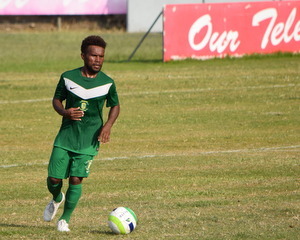 As the game drew to a close West Honiara pressed high to try to force Koloale into making errors close to goal but the experience of Leslie Leo and Cecil Buru held firm and their lines were not breached.